Announcement HANDMADE ARTISAN JEWELRY Gifts for Mother's Day. Repurposed, Recycled, Upcycled. 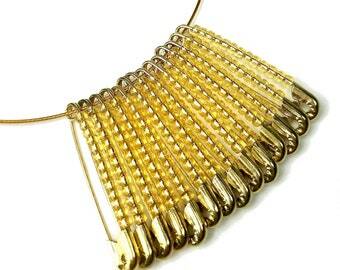 Statement necklaces, long necklaces, pendants, dangle earrings, ornaments. QUICK SHIPPING, your satisfaction GUARANTEED! Button necklaces, button earrings, art jewelry, fabric jewelry, fiber art, Day of the Dead jewelry, mandala jewelry, hair sticks, handmade gifts. 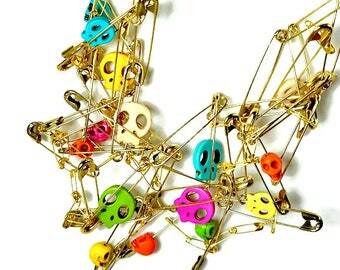 Specializing in unique, artsy and one-of-a-kind accessories for your colorful, creative style. LOOKING for something specific? Use the search box BELOW; type in "blue earrings", "flower necklace", "lightweight earrings", etc to find what you need! INTERNATIONAL SHIPPING: Canada: it will usually take a full 10 days after my 1-2 day processing. For other international shipping: it can take up to 8 weeks and buyer is responsible for any customs fees and taxes. If your country is not listed, please contact me for a quote: http://etsy.me/1F23juj The price under "others" is just an estimate. LOVE TO SUPPORT HANDMADE? Please be sure to favorite my items and shop! 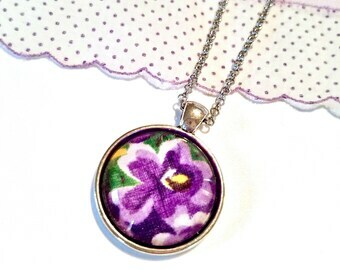 HANDMADE ARTISAN JEWELRY Gifts for Mother's Day. Repurposed, Recycled, Upcycled. 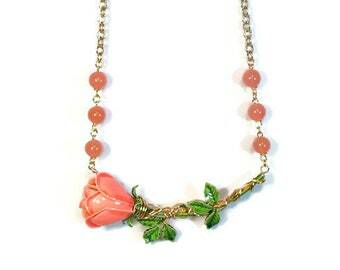 Statement necklaces, long necklaces, pendants, dangle earrings, ornaments. QUICK SHIPPING, your satisfaction GUARANTEED! Button necklaces, button earrings, art jewelry, fabric jewelry, fiber art, Day of the Dead jewelry, mandala jewelry, hair sticks, handmade gifts. Specializing in unique, artsy and one-of-a-kind accessories for your colorful, creative style. Working on more repurposed denim brooches, this one in Pantone Living Coral, the color of the year! Fun and Funky Brooch, Fabric Brooch, Repurposed Denim Jewelry, Art Jewelry, Upcycled Jewelry, Gift For Woman, Nothing Here Is Mass Produced! Upcyling denim & fabric scraps! See my latest denim brooches! 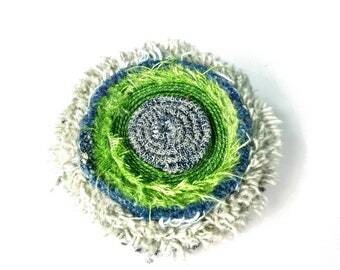 Lime Green Brooch, Repurposed Denim Jewelry, Fiber Art Jewelry, Upcycled, Sea Anemone, Artsy Gift For Woman, REAL Handmade Jewelry on Etsy! Working on coiled denim beads! 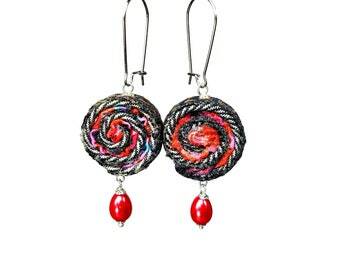 I love taking everyday objects and upcycling them like these fun button earrings. Chasidy says, "the craftsmanship is incredible, customer service is superb, even the packaging is cute"
BluKatDesign, featured jewelry artist in BeadMe Magazine's upcycling issue! A busy corner of my studio, making unique upcycled jewelry and wearable art I guarantee you'll love! Unique Handmade Artisan, Upcycled Jewelry and Gifts, Nothing Here is Mass Produced! WELCOME! I'm Heather, I love to make unique, one-of-a-kind statement necklaces and everyday jewelry by upcycling vintage jewelry and everyday items in to fabulous pieces you wont see on anyone else! 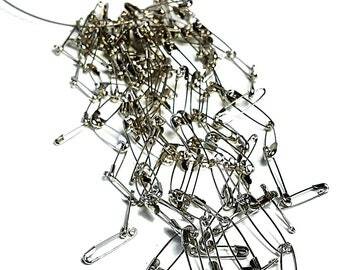 I love the challenge of taking an old funky clunky earring or bobby pin and creating something new that's totally fashionable today, easy and fun for you to wear. 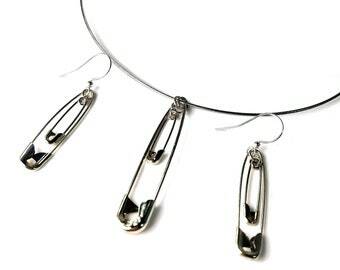 You will most definitely get noticed wearing BluKatDesign jewelry! If you love color and creative accessories this is your place! 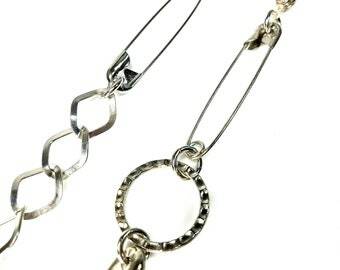 EYE FOR DETAIL, I have been making jewelry for over 35 years and have been a professional designer of high end modern gold and platinum jewelry in Seattle for over 30 years, studied jewelry design under the master of found object art jewelry, Ron Ho and have received awards for my art jewelry including an award from the Pacific Northwest Arts and Crafts Exhibition. The past several years I have been designing wedding rings using computer CAD/CAM also. I have been creative and artsy all of my life so when my niece told me about Etsy a few years ago it seemed only natural to open up an Etsy shop! HOBBIES: As if I don’t spend enough time making little things, I also have a love for dollhouse miniatures. I have made a Victorian dollhouse, several room boxes including an old fashioned clock and jewelry shop and an exotic tea shop. I also have made a garden with a conservatory complete with mini plants made of paper and polymer clay! If I am not working on jewelry or miniatures, I might be painting, crafting, hiking, foraging for mushrooms or playing with my puppy Zoe.
" I always love ordering from BKD! Never ever disappointed!! Fabulous quality, fast shipping, and wonderful customer service! " " Heather is an Artist - very willing to try new ideas and expand on them. The necklace is gorgeous and I will not hesitate to buy from BluKatDesigns/Heather with confidence again.
" On time and just adorable! 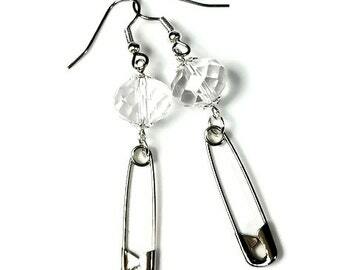 So many compliments on these earrings! 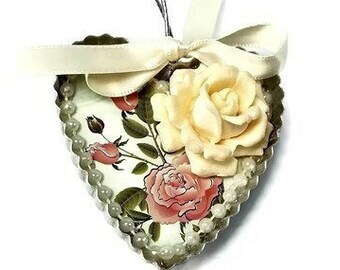 THANK-YOU for stopping by, please take some time and browse my shop and update your wardrobe with some creative new designs from BluKatDesign, jewelry for all ages and all styles form retro to modern: https://www.etsy.com/shop/BluKatDesign Be sure to "heart" or favorite my shop and items you love to help SUPPORT HANDMADE! "Nothing here is mass produced! Update your look with some colorful and creative new designs I guarantee you'll love"
Crazy Shih Tzu who likes to play with beads now is the new boss!